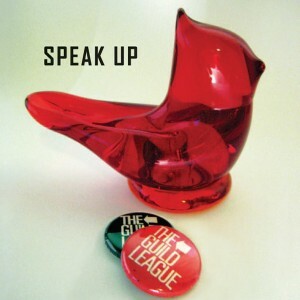 Long-awaited third album from Australian pop collective The Guild League, comprised of frontman Tali White (also of The Lucksmiths), lead-cellist/bassist Cressida Griffith, sax prodigy Gus Rigby, drummer about town Phil Collings, trumpet from Roger Clark, and guitar magic from Basic Shape's Gerry Eeman. The follow-up to the celebrated ‘Inner North’ album in 2004, new album ‘Speak Up’ is the sound of a band full of optimism and new ideas. There’s a little bit for everyone, from the insanely catchy guitar pop of ‘Suit Fits’ and ‘If Not Now...’ to ska-tinged swingers ‘Mouse vs. Mountain’ and ‘Where’s The Colour?’ to stunningly beautiful and poignant vocal showcases ‘Dead Hour’ and ‘Incandescent.’ The album mixes guitars with strings, keyboards, bursts of trumpet and saxophone, wonderful female backing vocals, and handclaps, all complemented by Tali’s crystal clear and perfectly pitched vocals. Imagine the younger brothers of Australia’s legendary Summershine Records roster (The Rainyard, The Sugargliders, Tender Engines) mixed with early 80s British pop staples (The Jam, Madness) and you’re nearly there. A refreshingly diverse and confident set from a band that only gets better with time.